Hello Friends! Back for day two of Lawn Fawn's October Inspiration Week. Today we are featuring projects using the new lawn cuts dies that coordinate with some older holiday sets. I am featuring Winter Owl and his matching Lawn Cut die. 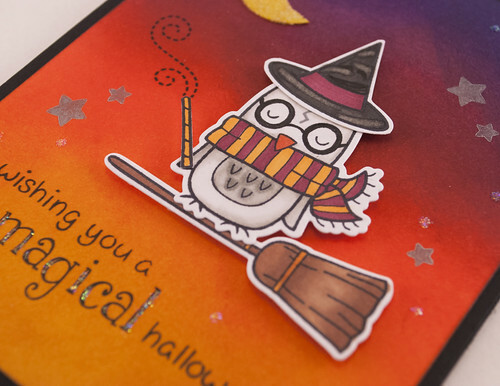 I turned Winter Owl into Harry Potter's companion Hedwig to create a halloween card. I colored the scarf in Gryffindor colors, drew in glasses and a lightning scar. I added the witch hat from Hats Off to You and tried to color it with my copics to look all frumpy and old like the sorting hat. The broom is from Frosty Friends (which also has new matching dies) and the wand is from Critters Ever After, I just cut the star off the top. Be sure to check out the Lawn Fawn Blog to see other projects featuring Winter Owl, Winter Bunny and Frosty Friends Lawn Cuts! Your background is perfect! And, that owl is adorable! My mom would love this, she loves Harry Potter! I love this card. 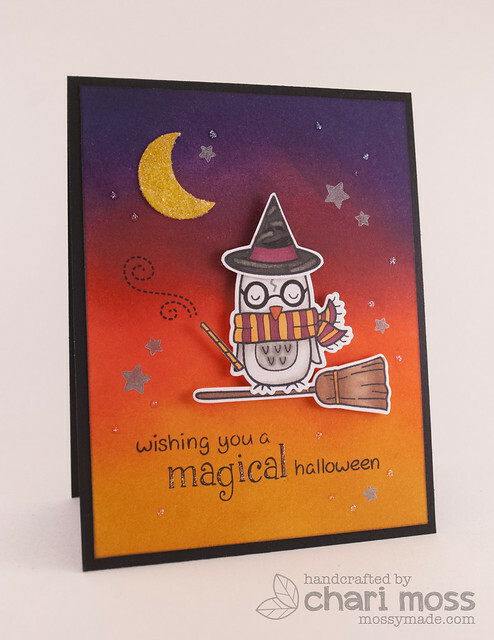 Gorgeous background and fab Harry Potter owl. I have the winter owl but need the other stamps now! Is this not a brilliant idea! Love love love. You're so incredibly clever. Hedwig...as Potter. Love It. You seriously outdid yourself with this one, Chari! SO clever! Love it! My son thinks this car is the best! Very cute and I love your colorwork. It's gorgeous.